Do not position it as pure reading device, but more as a way of organizing and sharing book content. Add notes and annotation (highlighting) functionality. 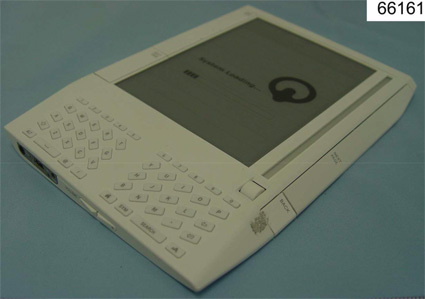 It seems that the service side of the offering is more mature compared to the existing Libre and Iliad e-readers. For instance, what’s nice is the ablility to buy content directly from the device (using a cell phone type connection), so no need to connect to a PC first. Also, there are several newspaper subscritions available. I still do not like the device design, it is not appealing at all. For instance, the ‘page turing bar’ of the Iliad reader is so much more elegant than the standard buttons on Kindle. Regardless, I understand that the device is already sold-out! Finally, Amazon is going to launch their much anticipated ebook reader in the US. The first photos and specs show a device that looks like a calculator from the 80’s! If this going to be the final design, this thing is a non-starter even before it hits the market. It will be interesting to see if Amazon can motivate publishers to start selling their content online and how to deal with DRM issues. There seem to be deals with NewYork Times and WSJ. Amazon will be competing with Sony’s Libre and Irex’s Iliad. This last company has the advantage of a more sophisticated display, since they are developing their own display electronics (all of the devices are based on the same E Ink material). Irex is planning a larger version and updated design by the second half of 2008.